When our good friend Andreas Schleicher stops by, it’s hard to resist asking him to lend his international perspective to some of the big questions facing education in the United States today. 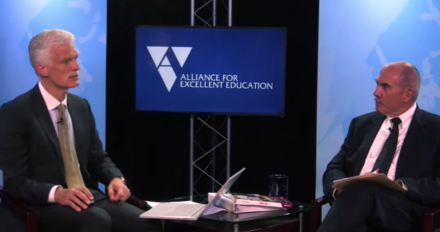 So, after our July 12 webinar on his new book, World Class: How to Build a 21st-Century School System, Andreas and I talked about politics, policy, and some of the challenges—and opportunities—facing the U.S. education system. Schleicher, director for education and skills and special advisor on education policy to the Secretary-General, Organisation for Economic Co-operation and Development (OECD), has a wealth of knowledge of good practice in countries around the world and what works in different educational contexts. In our short conversation, he addresses education as a “political enterprise” and discusses how to elevate the teaching profession, striking the right balance between accountability and local autonomy. He also offers thoughts on how science should inform pedagogy and tackles a huge challenge facing the nation’s future workforce. Pop in your ear buds or turn up your computer volume, grab your coffee, and spend fifteen minutes listening to our conversation. Bob Wise is president of the Alliance for Excellent Education and former governor of West Virginia.